Thanksgiving is this Thursday. It is now Monday. You have almost no time left to make plans. Give up on the dream of cooking — if you’re still holding on to it in the first place — and embrace the idea of Thanksgiving at a restaurant. Lucky for you, lots of amazing places still have reservations available. Here’s where you should go! If you want a super traditional Thanksgiving. If you’d rather do your splurging on Thanksgiving than on Black Friday, the Grill and The Pool are the places to do it. For a little under $200, the Major Food Group spots are serving a very classic meal, including pumpkin soup, endive and apple salad, goose terrine with figs and olives, buttered dumplings with brussels sprouts, and roasted turkey in a bourbon gravy flambé. For an extra $79, you can add the restaurant’s famous prime rib to your meal, and top it off with a slice of pecan pie from the dessert cart. This upscale power-lunch spot is keeping it pretty simple for Thanksgiving, serving up porcini-chestnut soup and roasted delicata squash salad to start before introducing roast turkey and halibut to the mix (with sausage herb stuffing, whipped potatoes, haricot verts, and more on the side). At the end of the night, choose between pecan pie à la mode, roasted apples with cinnamon ice cream, or a sweet potato ganache. This French restaurant in Soho will have butternut squash soup and a turkey duo featuring dark and white meat with sweet potato, parsnip meringue, stuffing, haricot verts, and gravy, plus classic pumpkin pie on tap. All this can be ordered à la carte with five other add-ons, including jalapeño cornbread and black truffle potato gratin. At this cozy Tribeca restaurant, expect homemade whole wheat bread and cranberry cornbread with pumpkin butter and maple syrup, Humboldt fog goat cheese salad, slow roasted turkey (or coriander-crusted pork loin), and pie, cookies, or a tart for dessert. This West Village spot will have three seatings (at 11 a.m., 3 p.m. and 6 p.m.) for a family-style dinner with smoked bluefish, a medley of fall foods (read: American ham, McIntosh apples, kabocha squash, etc. ), turkey legs and breast with long grain rice, and four different sweets. At Gabe Stulman’s laid-back West Village restaurant, the meal will start with homemade Chex Mix, crudités with French onion dip, and caviar and potato chips, before veering toward the classic, featuring kabocha and butternut squash soup, turkey, stuffing, brussels sprouts, green beans, mashed and sweet potatoes, and apple pie. For those who aren’t looking to throw down $60 to $100 for a prix fixe, Greenpoint’s Cherry Point is keeping it simple, serving items from its daily menu as well as Thanksgiving foods you can pick and choose from, like roast turkey breast with cranberry and bread sauces, turkey leg pie, smoked and honey-glazed root vegetables, and focaccia and sausage stuffing. While the appetizers will run the gamut at this Andrew Carmellini restaurant (read: Wagyu steak tartare, spinach gnocchi, pork ribs), the family-style main course is totally classic and includes roast turkey, mashed potatoes and gravy, brussels sprouts, spoon bread stuffing, sweet potato casserole, and cranberry-orange chutney. If you want a Thanksgiving with a twist. The twist here is that you can avoid all the Thanksgiving staples if you want to. Instead of a squash-based app, go for hamachi or lobster thermidor. For dinner, skip the turkey and go for dry-aged sirloin, diver scallops, or wild salmon (though turkey is available). And for dessert, forget all about pumpkins, apples, and pecans and enjoy a baked Alaska. Over in Midtown East, Japanese restaurant Mifune is offering a massive seven-course feast featuring sashimi, kabocha pumpkin soup, turkey truffle pie, soboro ginger rice, and Okinawa kibito caramel ice cream to end the night. Keith McNally’s downtown trattoria will mix things up for Thanksgiving, serving tagliatelle with a porcini ragù and beet salad with buttermilk dressing alongside the more classic roast turkey breast and a selection of classic pies from sister restaurant Balthazar. This spot from chef J.J. Johnson will offer a collard greens salad, tuna tartare, turkey leg confit, braised short ribs, praline pork chops, purple sweet potato pie, and other dishes that wink at Johnson’s Pan-African concept, starting at 11 a.m. on Thanksgiving day. If you’d like to avoid bland mashed potatoes and canned cranberry sauce this Thanksgiving, Indian Accent is your best bet. The restaurant will serve sesame-chili sweet potatoes, roast turkey pinwheels with sage, paneer, and a chili tomato glaze, cumin-maple brussels sprouts, and pumpkin and cranberry flatbread with sage butter, just to name a few standouts. At this Jean-Georges Vongerichten spot, guests will be spoiled for choice. Though there’s only three courses, both the appetizer and entrée courses offer five selections, including peekytoe crab dumplings, butternut squash minestrone, Maine lobster in herb butter, Wagyu beef tenderloin, and more. Three of this popular Spanish restaurant chain’s five locations will be open on Turkey Day (the one in Soho and those on the Upper East Side and West 40th Street, to be exact). Options include skate wing grilled on the plancha and served with fingerling potatoes, a platter of Iberico ham and Spanish cheese, squid ink noodle paella, a Spanish-style apple tart, or if you’re too chicken to stray from turkey, a roasted bird stuffed with mushrooms. Rather than prepare an entirely new Thanksgiving menu, the folks at Ferris will be serving their usual menu (hello, aged duck and katsu sandos) alongside a few specials, including a braised and fried turkey leg, cranberry kosho, and green beans with garlic and crispy onions. If all the options so far seem prohibitively expensive, Quality Eats is offering one of the best deals out there. For $24, guests can cop the restaurant chain’s Franksgiving offering, featuring two turkey dogs topped to overflowing with turkey chili, gravy, autumn slaw, stuffing fries, cranberry ketchup, apple mustard, green bean relish, and crispy onions. Or you could just eat a regular dinner, but where’s the fun in that? At this French-leaning Greenpoint spot, the kitchen will turn out acorn soup with Jonah crab meat, pâté de campagne, classic heritage turkey with chestnut stuffing, brook trout almondine, beef short ribs, and chocolate mousse or pumpkin pie to share. If you want Thanksgiving with a side of classic New York. There’s nothing like spending the holidays at a New York institution. This year, Katz’s will host a two-and-a-half hour dinner, starting at 5:30 p.m., featuring all the usual staples of Thanksgiving alongside Jewish deli favorites, including pastrami, latkes, tzimmes, pickles, matzo ball soup, corned beef, and babka. This year marks this Cuban cafe’s 55th year in business and the staff still knows how to bring the party. On Thanksgiving, Victor’s will serve a few Thanksgiving staples alongside its own Cuban menu and some live music. Get the ropa vieja and a mojito and you’ll be set. For those who prefer a gaudy Thanksgiving feast with high tea, there’s the Russian Tea Room. For Thanksgiving, they’ll serve Eastern European staples like red borscht, duck blinchiki, stroganoff, chicken Kiev, and kulebyaka — as well as turkey, pumpkin tart, and a market salad, if you want something more traditional. While the 23-year-old Bryant Park Grill doesn’t have as much history as the restaurants above, it does have an unrivaled view of one of the city’s most iconic landmarks: the New York Public Library. On Thanksgiving Day, head to 42nd Street and 6th Avenue for a meal featuring roasted honey pumpkin soup, turkey breast and pork tenderloin, chocolate fudge cake, and more. 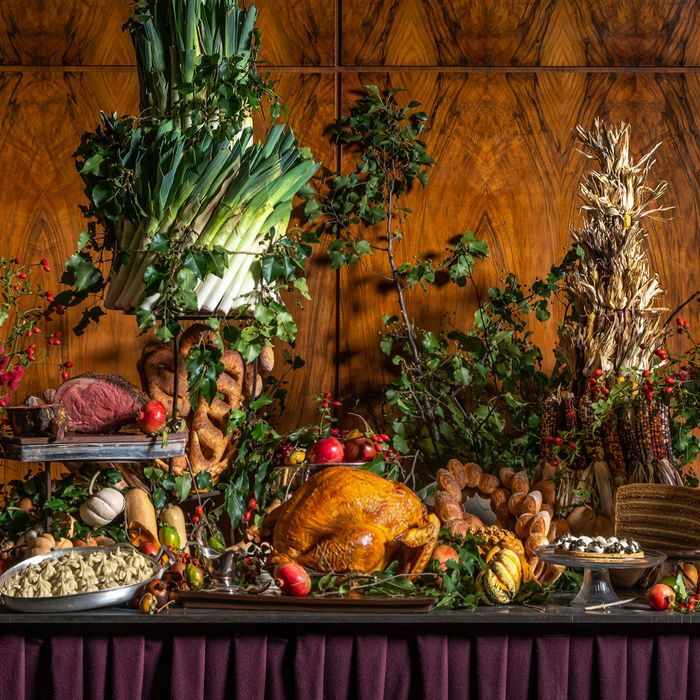 If you want to take in Central Park’s turning leaves one last time over a gorgeous dinner, then you’ll want to fork over the big bucks for Thanksgiving dinner at Jean-Georges. Among the menu items are sautéed foie gras with avocado and radish in a ginger marinade, black sea bass crusted with spices, and roasted turkey filled with foie gras and chestnut stuffing (or caramelized beef tenderloin, if you’re all turkeyed out). If you want a vegetarian Thanksgiving. If you don’t even want to see meat on Thanksgiving, abcV is your best bet. For Thanksgiving, the vegetarian restaurant will serve everything from honey nut squash with tahini and whole roasted black maitake mushrooms to wood-grilled baby artichokes and apple pie with cinnamon ice cream. Andrew Carmellini’s Tribeca restaurant remains as vegetable-leaning as ever, and for Thanksgiving, diners can look forward to autumn squash soup, sunchoke risotto, roasted carrots, braised swiss chard, and, because it’s Thanksgiving, after all, a slow-roasted turkey with sweet sausage and wild mushroom stuffing. At this East Village-adjacent restaurant in the Standard, lunch and dinner will be available starting at noon. Among the healthier options are a Narcissa salad with apples, figs, toasted hazelnuts, and parmesan; smokey Japanese sweet potatoes with preserved chilis; a grilled carrots entrée alongside candied walnuts and labne; and a whole roasted red snapper. And among the desserts you’ll find vegan affogato made with almond milk ice cream. If you want to order pies, sides, or even a turkey to go. It’s no surprise that this super-popular bakery is coming correct for Thanksgiving. Not only will they have pies like Apple Double Crust, Pumpkin Praline, and Black Bottom Pecan, they’ll also have a thoroughly autumn-ized version of their banana pudding with pumpkin and gingersnaps. Those looking for a more down-home Thanksgiving need look no further than this Gowanus barbecue spot, which is selling a $250 package with enough food to feed eight to ten people, including a smoked whole turkey or a brown sugar and maple-glazed spiral-cut ham with giblet gravy and cranberry sauce. For sides, choose between mac ‘n’ cheese, mashed potatoes, cornbread stuffing, baked beans, purple coleslaw, and green bean casserole; dessert will come down to pumpkin pie, apple pie, or red velvet cupcakes. Everything can be ordered à la carte, as well. Email catering@pigbeach.com to put in your order. If you work or live in Flatiron (or are just very committed to all things Daily Prov), Danny Meyer’s all-day cafe will have a chocolate bourbon pecan pie covered in waves of ganache and a sprinkle of Maldon sea salt as well as a pumpkin pie with whipped cheesecake on top. Throw in an order of ten caramel chocolate chunk cookies and you’ll be the life of the party. Pickup is available on November 20 and 21 as well as on Thanksgiving day from 8 a.m. to noon. In addition to its bottomless list of ice cream flavors, the new Morgenstern’s flagship on Houston will be selling whole pies, including a bourbon pecan pie with a sweet dough crust, salted caramel custard with a pretzel crust, and a cinnamon apple pie with a pork lard crust. Orders must be made at least 48 hours before pickup. Both locations of Fleishers (on the Upper East Side and in Park Slope) are accepting orders for uncooked turkeys, from a traditional American turkey “raised to superior standards” to a more pricey heritage bird that spent its life eating berries and nettles. The turkeys are fresh and never frozen and will be available for pickup starting on Monday, November 19. If you only want to cook the turkey and let someone else take care of the rest, Marlow & Daughters in Williamsburg is the place to go. Customers can choose between a fresh, uncooked organic or pastured turkey and then add a brining kit, roasted brussels sprouts, cornbread and sausage stuffings, pumpkin pie, nine different loaves of bread, and a Thanksgiving meal for the family dog. All you have to do is pop the bird in the oven once you get home. Grab ten of your closest friends, ask each of them to front you $40, and head to Momofuku Ssäm Bar to pick up your Thanksgiving dinner, featuring honey-glazed pork shoulder, scalloped potatoes with cheddar and gruyere, iceberg salad with Italian dressing, green bean casserole, and a sweet potato tres leches cake. 48-hour notice is required and the very narrow pickup window is between noon and 1 p.m. on Thanksgiving Day.